I have two more blog posts to squeeze in before the 31 Day Challenge starts on Thursday, and they will round out my series on the Polish Chrome Wars. 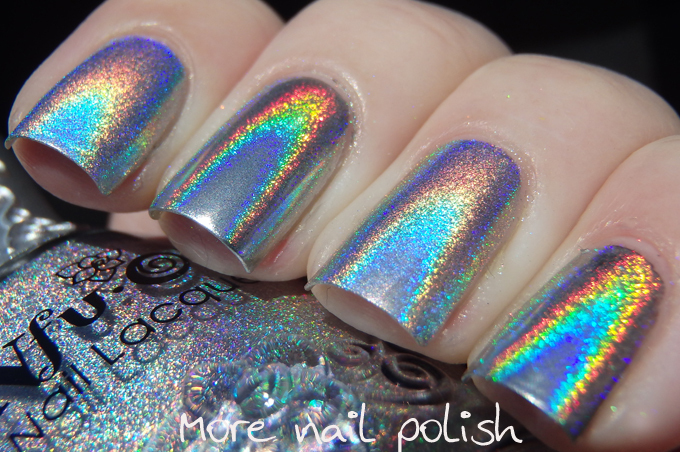 Today's installment is Polish vs Powder in the battle of whether holographic nail polish or holographic powder is the winner when it comes to holo-awesomeness. The first comparison is between some of the 50 micron holo powder (over black) and the holo-est polish I own Nfu Oh 61 (original version). You can see my silver holo polish swatch comparison and my silver holo video comparison to see why I chose that polish as the most holo. Wow, these are so different. The index and ring finger and Nfu Oh 61 and the middle and pinky finger are the holo powder. The flame has a stronger colour intensity and is much tighter with the holo powder, even though the particles are bigger. The polish is less intense but also shows more flame on the nail at once. 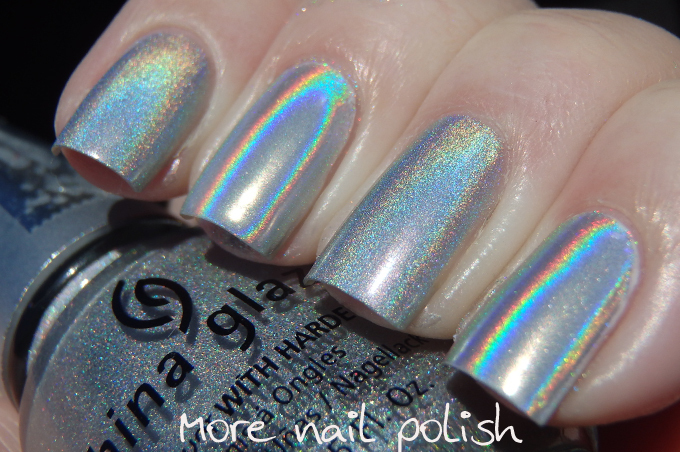 My second comparison was with China Glaze OMG and the finest particle size holo powder from Daily Charme (over white). OMG is on the index and ring finger and the powder is on the middle and pinky. Again, these are so different. 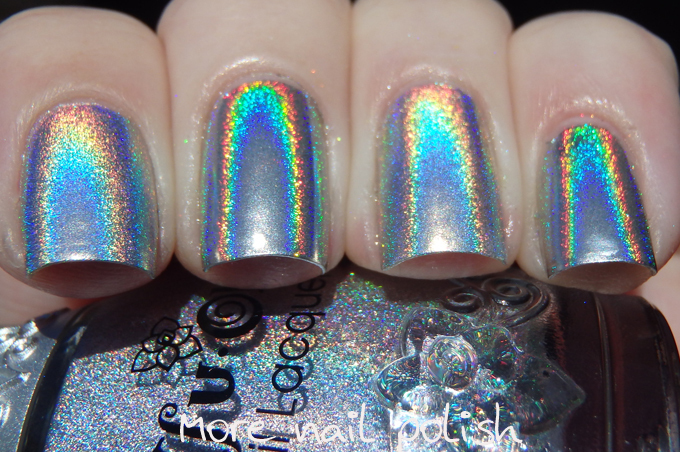 I can't believe how lousy the holo powder makes OMG look. OMG is by far the finest and smoothest holo polish you can get (or not get as the case my be) and it looks like nothing compared to the powder. My verdict on the winner. Powder. And the powder would likely have better staying power too compared to these holos, which are generally considered rather chippy and don't stay on your nails for long. Fantastic comparisons! I can't believe the difference in flame! Did you use the powders over a normal polish or a gel polish? Both these swatches with the powder were using Dance Legend Peel off base coats, so not gel. 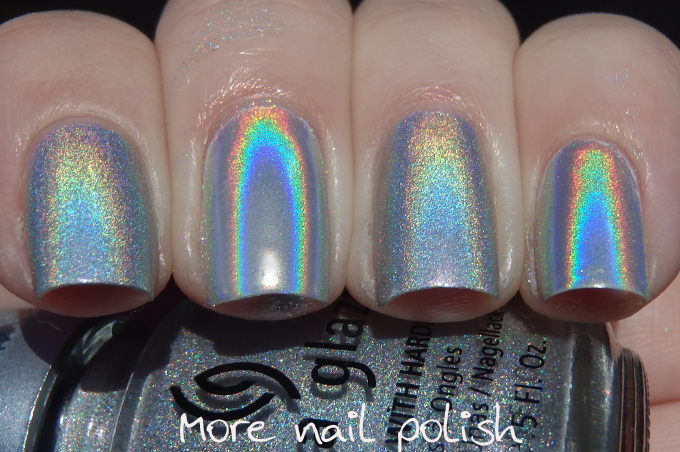 I did try it over holo polish and didn't find that it made much difference becuase it powder is quite full coverage. these have to be over gel, right? Nope - I've just done it over a peel off base here. They also work on regular polish, check out this post for details. Holy cats! I need this. I have OMG and I just. can't. even! Your posts are seriously the best, and are everything I needed to know about these powders. Thank you so much! This glitter polish is so wonderful. I've seen several ideas at http://nailartstyle.com/wow-top-35-holographic-nail-polish-options and want to say that glitter looks so amazing and like a new year tree.